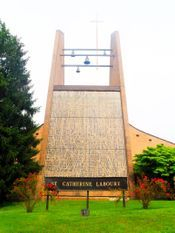 The Archdiocese of Washington founded St. Catherine Labouré parish in Wheaton, Maryland in 1951. Formed from neighboring Holy Redeemer parish in Kensington, St. Catherine’s immediately attracted hundreds of young Catholic families from the rapidly growing suburbs around it. These families built not only a parish but an ethos; a welcoming spirit of community that originally drew in Catholics of varied backgrounds who had come from all over America to live and work near Washington, DC, and now embraces a diverse mix of peoples from every part of the globe. Remarkably enough, St. Catherine’s has known only three pastors in its six decades. Its founder, Msgr. W. Joyce Russell built the two churches, school, rectory, and convent that have made St. Catherine’s one of the biggest parishes in the Archdiocese. Monsignor Russell lived a long and full life; born in 1905, he heard Theodore Roosevelt give a speech and saw Babe Ruth play baseball, met Pope John XXIII in Rome, and shared vivid memories of his years as pastor until just before his death in late 2001. He celebrated his first Mass with the parish at the local Veirs Mill Theater (now a drug store at Veirs Mill and Randolph Roads), and his last as pastor in the parish’s new church in 1984. St. Catherine’s second pastor, Msgr. James Beattie, picked up where Msgr. Russell left off and saw the parish welcome a vibrant Hispanic presence. The current pastor is Msgr. Robert Amey, who grew up in nearby Hyattsville and joined the parish in 1994 after serving at several parishes in Prince Georges County. Parish life in the early days centered around the church and the school. The young families who had moved out to the Montgomery County suburbs from Washington, or who arrived here from other states, found many ways to socialize and raise funds to pay for the seemingly perpetual building projects around the parish in its early years. Pledge drives, car raffles, oyster suppers, and a huge carnival every summer were but a few of the many ways that parishioners came together. Parish dances were another popular draw. This was the height of the “Baby Boom,” and St. Catherine’s seemed to have more than its share of big families and willing hands. The Sisters of Charity, based in Emmitsburg, Maryland, long staffed the parish school. Their order, founded by St. Elizabeth Ann Seton, has a special commitment to education and serving the poor, and the sisters remained at St. Catherine’s until 2004. At its height in the mid-1960s the school taught over 1400 students at once; classrooms with 60 or more kids were common. Having 15 or more sisters living in the convent made education on such a scale possible, and kept expenses low. In 1961, for instance, a family could send four children to the parish school for $8 a month (that bill would be slightly higher if the kids needed to ride one of St. Catherine’s school buses). As the children of the Baby Boom generation grew up and started families of their own in the 1970s and 1980s, the surrounding neighborhood of Wheaton saw another influx of newcomers. Immigrant families from Central and South America began buying affordable homes in the area, and in 1976 St. Catherine’s began offering a weekly Mass in Spanish (a second Spanish Mass was added in 1995). The Rev. Jesus Arenas took a room in the rectory in 1977 to become the first priest ministering principally to the parish’s Hispanic community, and since that time the parish has been a center of worship in two languages. St. Catherine’s represents a powerful engine of assimilation for immigrants from all over—a big step on the way for thousands of people and families to become Americans, much as the parents and grandparents of St. Catherine’s first parishioners had done themselves decades earlier. Indeed, their dances, fundraisers, and “cafés” look and feel remarkably like those in St. Catherine’s early days. St. Catherine’s began changing again with the opening of nearby Metro stations in 1999. Its school is only a fraction of its former size and has a lay staff, but it still educates a highly diverse population, with students from families that speak dozens of languages. Rising property values and the rebuilding of Wheaton and Glenmont around the subway stations promise a more urban look and atmosphere for the neighborhood around the parish, which is nonetheless likely to remain a true melting pot of cultures and social groups for years to come. St. Catherine Labouré parish has always been a work in progress. 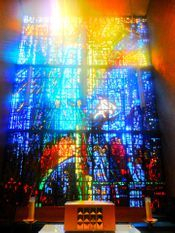 Never finished, always changing, it represents in its small confines something of the best of America and of our Lord’s one, true, catholic, and apostolic church. Here people from every continent come together to live and work and worship, to educate their children alongside one another, to volunteer their time, talent, and treasure to common projects, and to join hands at Mass and the sacraments. This is progress on a truly neighborhood scale—perhaps the scale where it best takes root to change hearts and lives.